On World Environment Day last year, we made a promise to plant 1,000 trees across the U.K. to help improve air quality, absorb CO2, and increase biodiversity. You can read more about our promise, and the thinking behind it in our original blog post. We made the promise because we think it’s important we do what we can to tackle CO2 here in the UK, and because – quite simply – it felt like the right thing to do. I’ve spent the last few months travelling across Britain, meeting amazing people from schools and community groups, and planting trees. 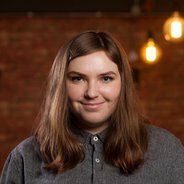 I thought I’d share some of the stories of the people I’ve met on the way. To date, we’ve planted over 1,600 trees around the UK. Here’s a map of all the places we’ve broken ground. Click the little octopuses to see pictures of each planting! 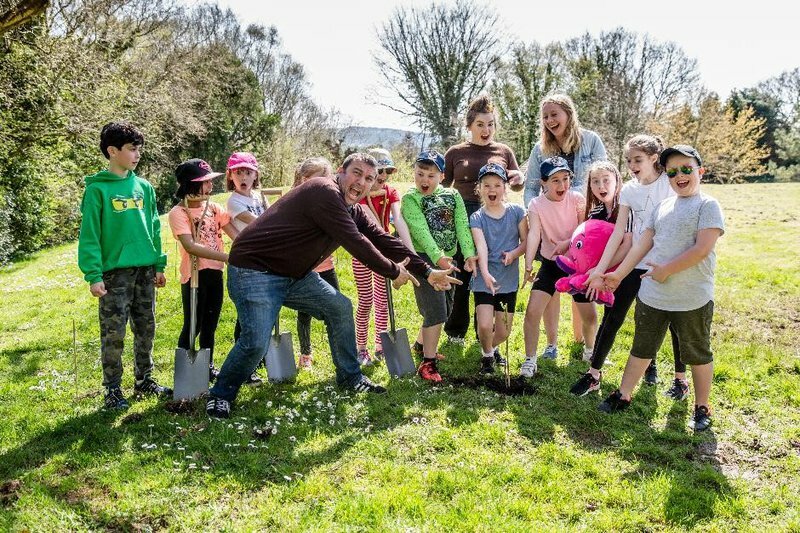 What we hadn’t anticipated was just how rewarding it would be to get out of the office and see firsthand the way tree planting can bring people together, get them talking about important issues like the environment, and to make a real difference to a community. A few highlights from my journeys around the U.K.
We teamed up with Arsenal in the Community to plant trees at St Andrews Primary in Islington. 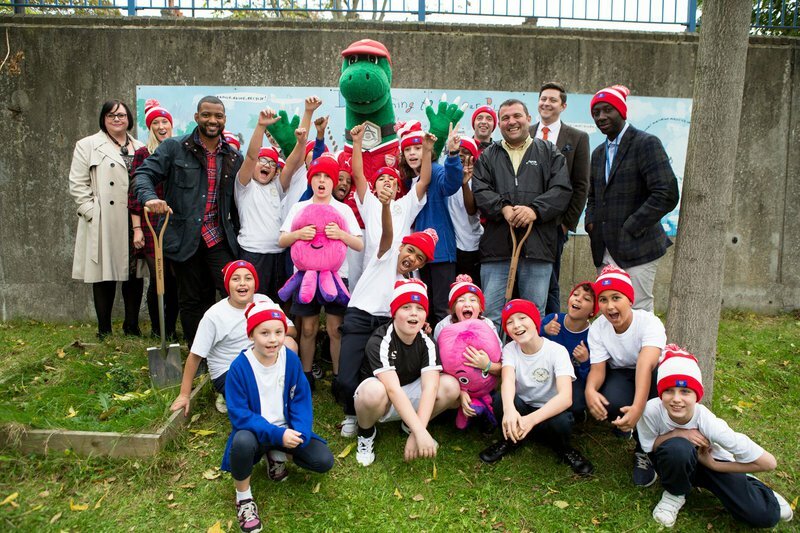 We had a whole team of planting helpers from Chris Collins to JB Gill to Gunnersaurus! Our planting at St Andrew's was covered in My Green Pod and The Islington Gazette. We planted 6 trees at Spinney Hill to celebrate the opening of our new office in Leicester. This school, set right in the city, doesn’t have much in the way of green space (though we LOVED their “mud kitchen”!) We were so happy to be able to add some greenery to the grounds. Our main gardening guys, Chris Collins and JB Gill, came along to help us plant. JB received a rapturous reception from the teachers! Next, we trekked up to historical York to add some trees to the amazing nature reserve looked after by St Nicks. This site, formerly a landfill, has been transformed into an incredible 21-acre reserve. Baby octopuses aside, all manner of critters live here, from badgers to water voles and even otters. 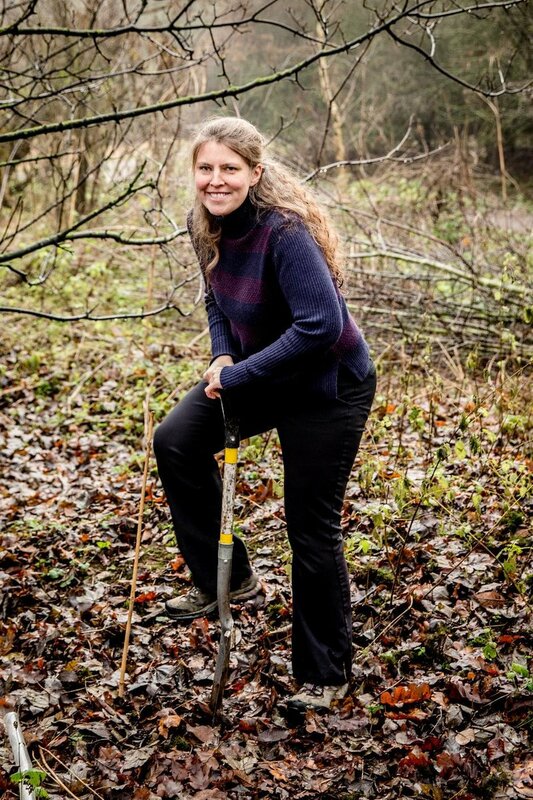 Rachael Maskell MP came along and got stuck in too, helping us to plant 50 hazel, holly and hawthorn trees to develop an understory. 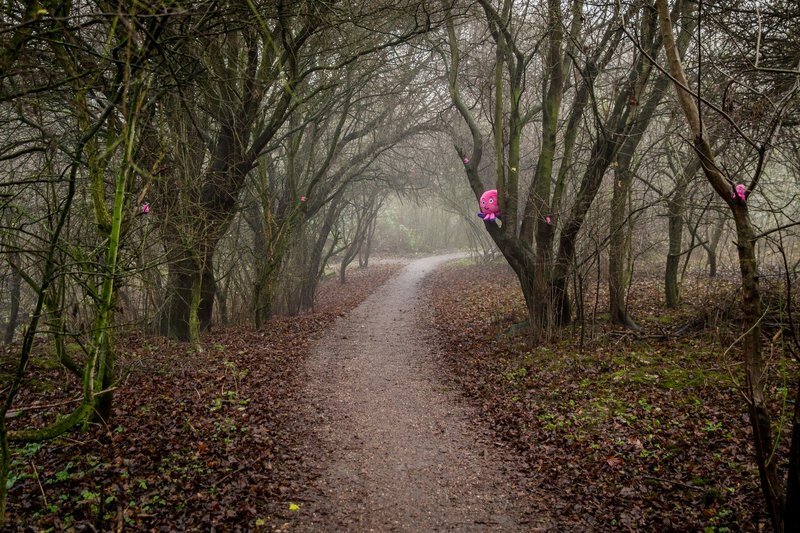 The York Press covered our planting at St Nick's nature reserve, and Rachael wrote a lovely piece about it for her blog. We travelled down to Brighton to plant a hedgerow of hazel trees to shelter the school’s new outdoor learning area from chilly coastal winds. The creative gardeners came up with a brand new toy: “baby octopus on a stick” (pictured). The fantastic Lloyd Russell-Moyle MP came along and helped us plant - working in the mud in a full suit! 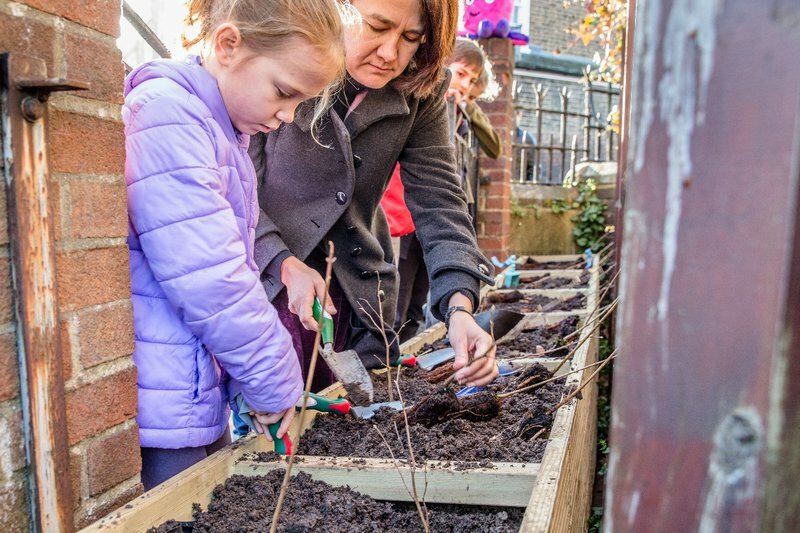 We braved taking a full-sized pitchfork on the Northern line to plant 100 trees at Highgate Primary in London to grow into a hedge along the fence line. This school is situated within 150 metres of a road travelled by more than 10,000 cars per day. Our visit to Highgate emphasised how crucial efforts to minimise air pollution are in a city like London. Catherine West MP, antipodean like ⅔ of the Octopus tree team, was fantastic help. It was really exciting to chat to her about her efforts to minimise the plastic packaging in UK supermarkets. 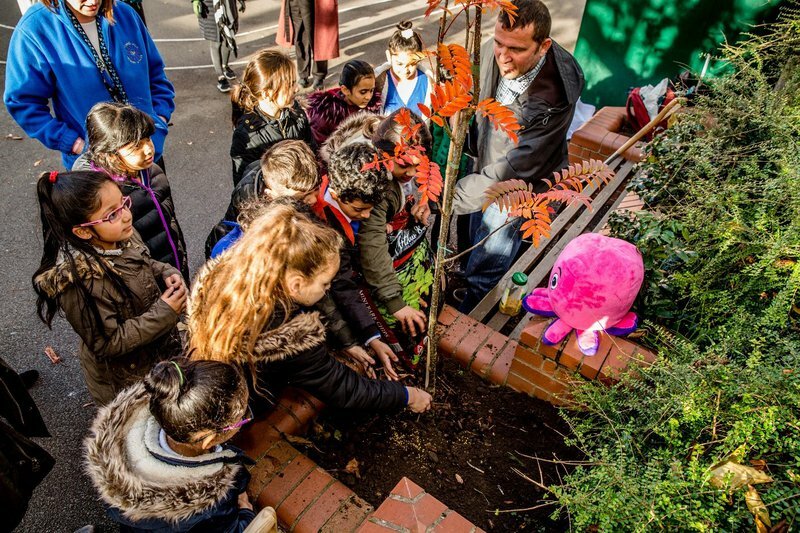 We featured in Ham & High for our work planting at Highgate Primary. Their head teacher William also covered the planting on the school's website. 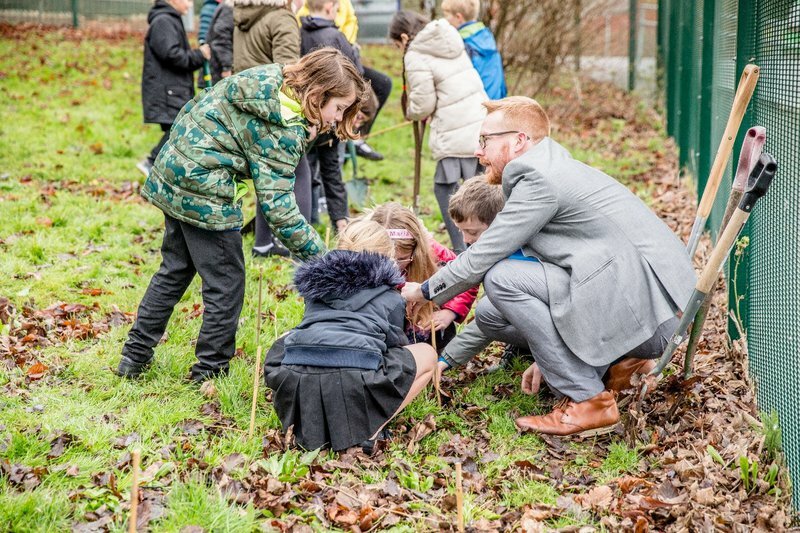 We travelled to Spindle Point Primary in Bolton, planting a mini-woodland of a number of native trees including field maple, wild cherry, and english oak, to help start the school’s Forest School. The school held a nature-themed art competition to decide who would get to help us plant the trees. Super headmistress Jenny showed us some of their amazing creations, from a hedgehog made from autumn leaves to a tree sculpted from recycled plastic bottles. Yasmin Qureshi MP was a massive help and miraculously managed to keep her pristine white dress free from mud! Our planting at Spindle Point featured in The Bolton News. 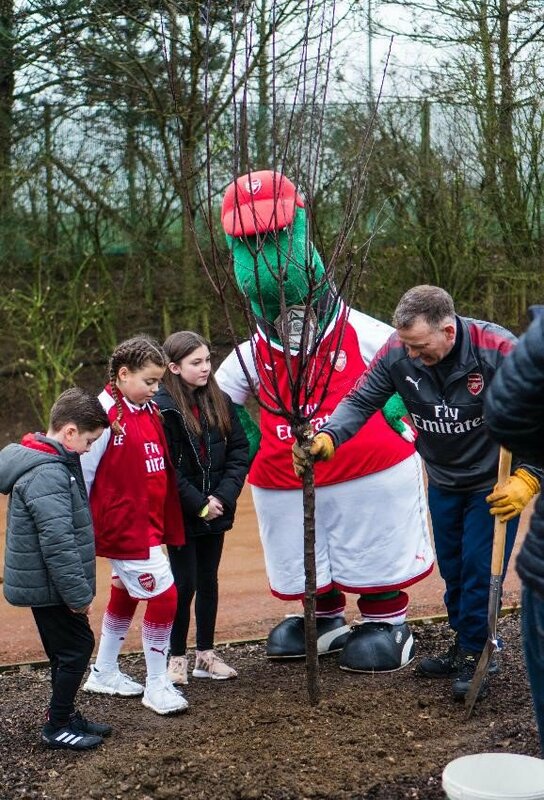 We continued our tree planting at Arsenal's training ground in London Colney. Three lucky Junior Gunners won a competition to plant the trees with Shkodran Mustafi, Sead Kolasinac, Henrikh Mkhitargan, Gunnersaurus and Michael the Groundsman. We spent an inspiring morning at Boston West Academy planting an English oak and 10 beech trees with the school's Year 6 Eco Warriors. Their school's deputy head, Emma, showed us around the grounds where we saw a willow tree maze, a reflective outdoor area encircled by a carved wooden dragon, a tree-themed reading room, and even some very well-loved (and well-fed!) chickens. Their amazing Forest School made all of us wish we were all back at school! Our lovely SuperGreen customer Kevin, who recommended we plant trees at Boston West (his granddaughter goes there), came along to help us plant too, as well as the fabulous Matt Warman MP who dug deep to get these trees in the ground. 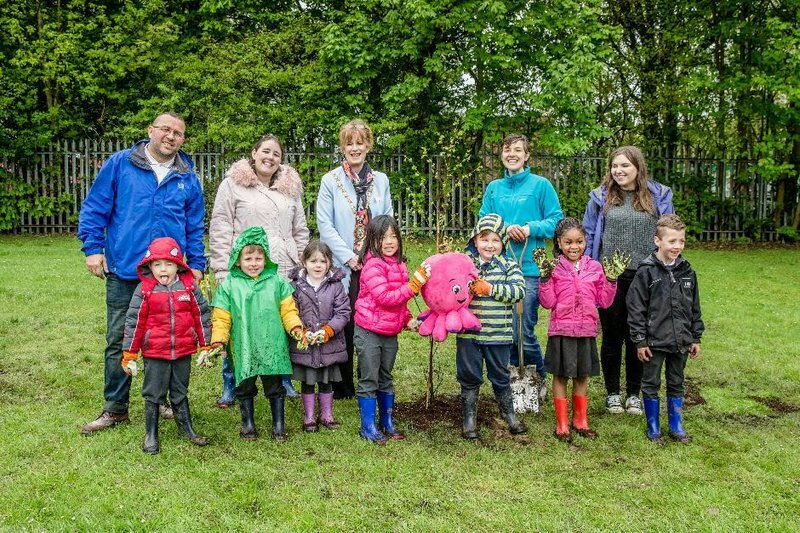 We hit a fantastic planting milestone of 1,500 trees in Grove Park, where we planted a mini orchard of crabapple, hazel, and wild cherry trees on “The Railway Children’s Walk”. This secluded green walkway near the railway line was where Edith Nesbit was inspired to write her classic children’s story. 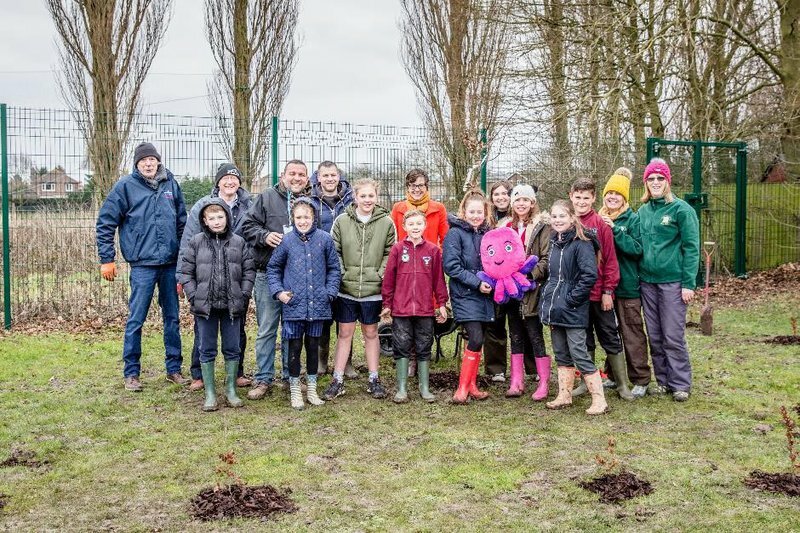 Our planting brought together local Councillor Mark Ingleby, Stephen from the Grove Park Neighbourhood Forum, and lots of lovely volunteers from the community to green up a favourite local spot. Next up, we travelled to our first Welsh tree planting, in Swansea. We planted a hedge of hawthorn, wild cherry and hazel at this lovely school under the baking sun (the true Welsh experience). Glyncollen’s awesome eco council and their teacher Rhian joined us toiling away in the sun, overseen as always by Chris Collins, gardener extraordinaire; our awesome photographer Lisa; and Constantine the fluffy octopus. Fun fact: Glyncollen actually means "Valley of the Hazel trees" in Welsh! 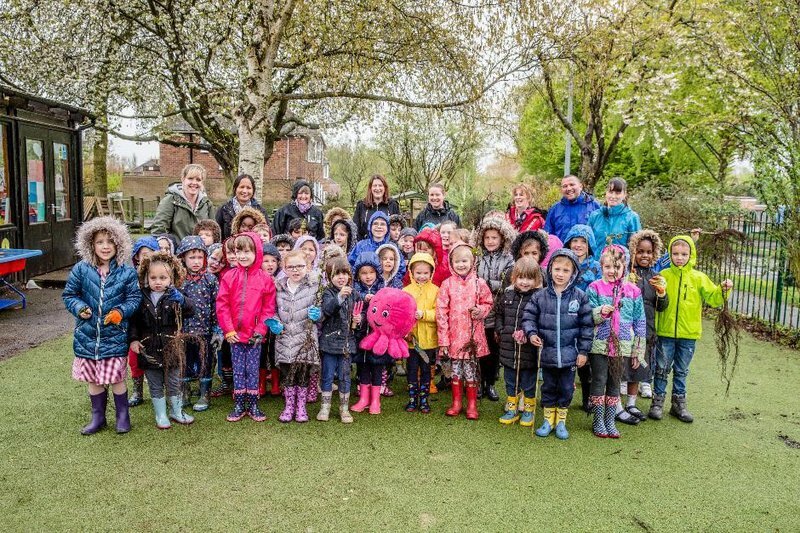 This time, a double whammy— planting 110 trees in two Rugby schools with the help of Rugby's fabulous Mayor Belinda Garcia who braved the rain to give us a hand. 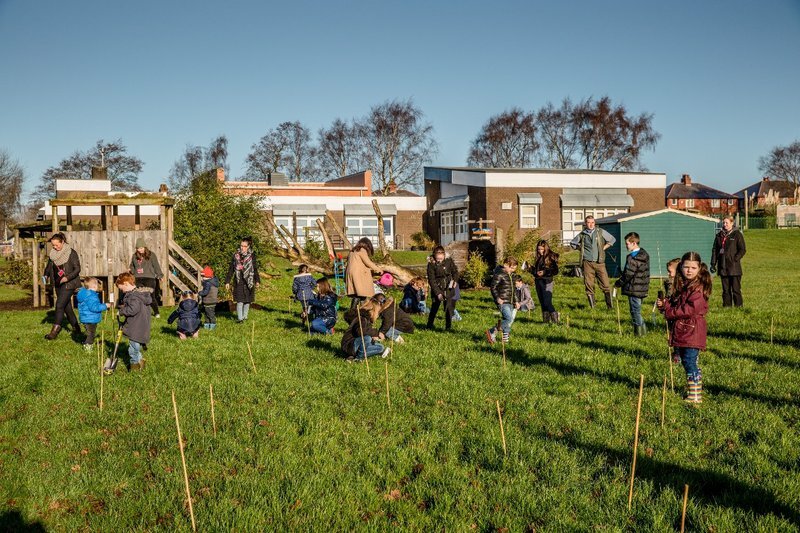 First we added 10 cherry and birch trees to the Gruffalo wood at Boughton Leigh Infant School, before heading to Abbots Farm Infant School to plant 100 hazel and maple trees with nearly 200 keen little gardeners to form a hedgerow around their play area. Our fluffy octopus needed a trip to the dry cleaners after the day's efforts! We've finally come to our last planting day! We finished up with something a little different. Gardening wizard Chris Collins held a workshop with the cool kids of St Stephen's, teaching them to build their very own wildlife garden complete with everything from beautiful flowers to bug hotels. Sir Vince Cable came along to lend a hand, too. Our gardening adventure was featured in The Richmond and Twickenham Times, Your Local Guardian and This is Local London. This planting season has been a huge success, and particularly rewarding for me on a personal level. We’re already planning on going bigger and better for our next planting season, so watch this space! Planting season kicks off again next Winter, but we'll keep you in the loop in the meantime about our upcoming plans. If you think your school or community group might be in need of some trees, please drop us a line to trees@octopus.energy. 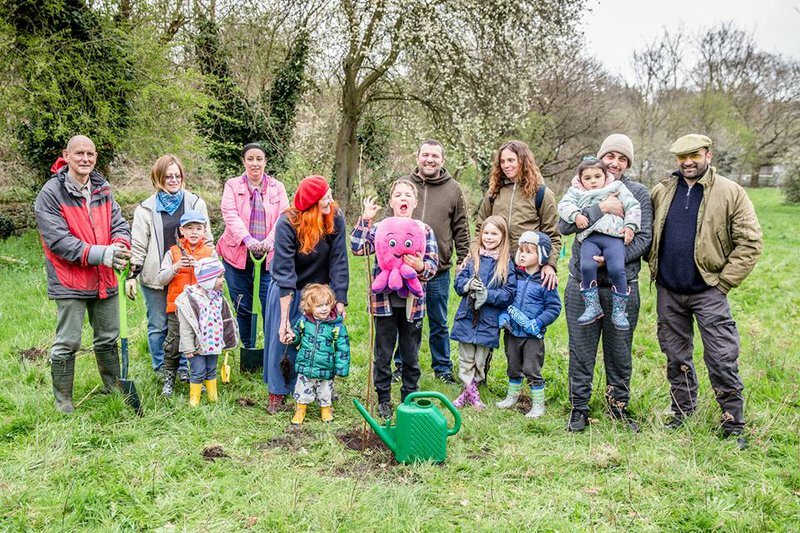 The York Press covered our planting at St Nick's nature reserve, and MP Rachael Maskell wrote a lovely piece about it for her blog. 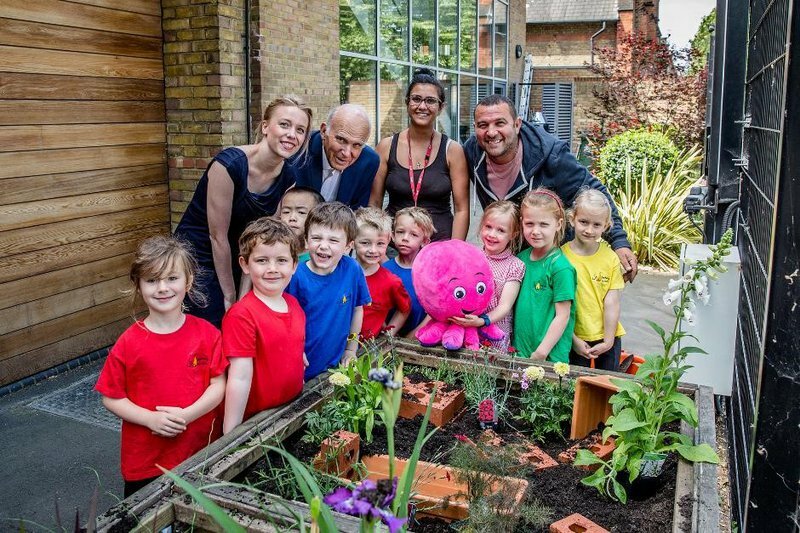 Our gardening adventure at St Stephen's Primary was featured in The Richmond and Twickenham Times, Your Local Guardian and This is Local London.